My latest project. I can't put it down. occasion to wear it, but you would think by the way I'm working on it that I need it tomorrow. It's just fun and easy. would find it now. Ravelry features it but the link leads nowhere. It's called Trellis and Vine by Sauniell N. Connally and it's a lot of fun to make. 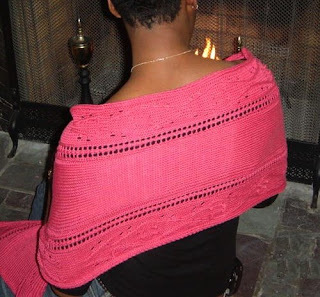 A great pattern for beginning knitters to learn a few new "moves". 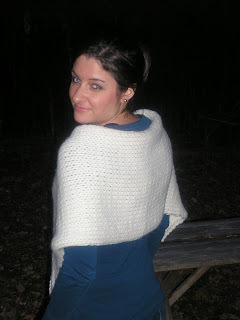 Anyhow, my version is in aran weight as opposed to DK and it will be larger and warmer which is what I like. The yarn is Kraemer Yarns Naturally Nazareth and I'm liking it alot. Check it out, then order it here. (In case the links are not highlighted, click on the words "Kraemer Yarns"
This is the second pair of socks I made for Clare. 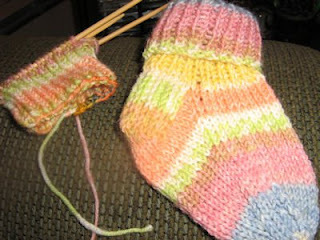 This is some left over sock yarn and the other pair was also a stash-busting accomplishment. My daughter tells me they are difficult to keep on her feet. Maybe the next pair should include some yarn-overs (holes) with an i-cord lace strung through to keep them on. I'll work on that. I made a simple stockinette stitch wrap for Catie (daughter # 2) and sent it off to Charlottesville without thinking to take a photo. She is charged with sending one to me soon. It's cute, and it was made with Rowan "Big Wool". It knit up in three nights on size 15 needles. I made up the pattern but there wasn't a whole lot of magic to it. Knit a row, purl a row. I blocked the heck out of it so hopefully it won't roll. We'll see. Below is a scarfette for Kelly. (daughter # 1) I made this pattern up too. Hopefully if I ever want to duplicate this stuff I can remember what I did. I didn't write any of it down. Don't ask me why Blogger turned this photo sideways. I can't figure out why Blogger does most of what it does. 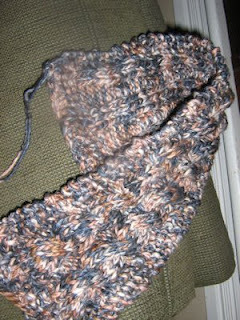 Anyhow, it's done in Manos del Uruguay that I bought at Purl Soho in NYC. Two strands held together on size 10.5 needles. It should be very warm around the neck. Also a stash-busting accomplishment. (yay!) It's currently on the blocking board and I'll get a better photo of it after I sew on the buttons. And, for those of you who were wondering..... yes, I do know that cables are best left for solid colors. But I was in cable-y mood! What can I say? 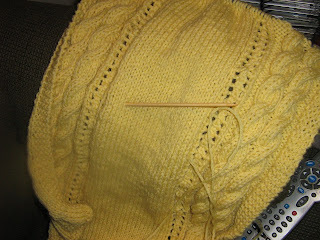 Right now, I'm working on a rectangular cable wrap of my own design out of a pretty yellow aran wool. (I have to admit that I just re-worked s few small things from another pattern that I already did) Photo to come. The diet is going ok. I'm still grumpy. I like sweet stuff. I like Starbucks coffee drinks that are a calorie nightmare, I like wine. Oh, I love salty snacks too. Ugh. Thank God I still have knitting.